Having asthma can be challenging for anyone, especially children. Asthma can result in sudden breathing difficulties, and asthma attacks can be quite frightening. As a matter of fact, child asthmatics were once discouraged from participating in strenuous exercise. Now, however, that’s no longer the case. Asthma is a condition that affects breathing. During an asthma attack, the bronchial tubes swell and narrow, making breathing difficult. Symptoms can include wheezing, coughing, and tightness in the chest. The usual remedy for an attack is medication taken through an inhaler, but getting back to normal can take a few days. So the question is: should a child with asthma be playing basketball? Asthma is usually triggered by impurities in the air. Common triggers are dust, pollen, mold, cigarette smoke, perfume and chalk dust. Since most of these of these triggers are actually found indoors, it would seem that there is less risk of an attack outside. In other words, there is no “asthma-free” zone. But overall, the outdoors has fewer asthma triggers than indoors does. Not only are there fewer triggers outdoors, but playing sports has other benefits for asthma sufferers as well. Being active reportedly helps lungs get stronger. This is quite beneficial for anyone with asthma. So playing sports outside may be just what the doctor ordered! But, there are certain precautions children with asthma should take when they play sports outside. Asthmatics should not be outside when there’s a lot of pollen in the air. They also should make an effort to breathe through their nose instead of their mouth while exercising. This will filter the air through the nasal passages before it gets to the lungs. Having a careful warm-up and cool-down is also very important, as is letting fellow players know about the asthmatic’s condition. 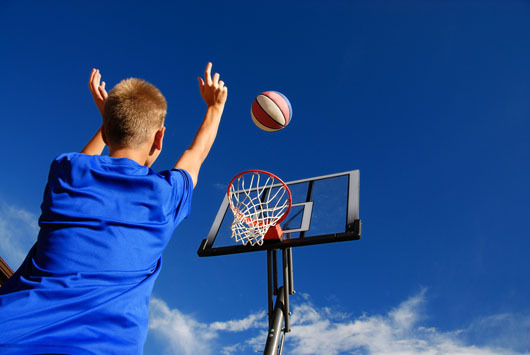 So, by playing it safe, kids with asthma can have a lot of fun and great exercise playing basketball. So go to Kars4Kids and claim your free basketball! This article should not be a substitute for professional medical advice. If you have asthma and want to participate in any sport or exercise, please speak to your doctor. Great article! Stay strong and follow your passion!